NewsGuard is not part of Microsoft—it's a startup based in New York that aims to fight misinformation. It shows a red or green rating icon in the address bar. As you can probably guess, red means the site is considered untrustworthy. You can tap on the icon to get more information about the rating, with which you may or may not agree. NewsGuard isn't enabled automatically, but Edge does highlight the new feature with a blue dot in the settings. It's reasonable to expect a lot of people will turn it on. Sites like RT, Daily Kos, and Sputnik are all hit with the red icon in NewsGuard. Mainstream sites like MSNBC, Fox, and CNN are all green, and I'm sure many people would like to disagree with that. The UK-based tabloid site Daily Mail is also listed as unreliable, and it is strenuously objecting to that classification. Although, I think everyone across the political spectrum can get behind NewsGuard on that one. You can see the full rationale for a rating in the "nutrition label" linked in the warnings. 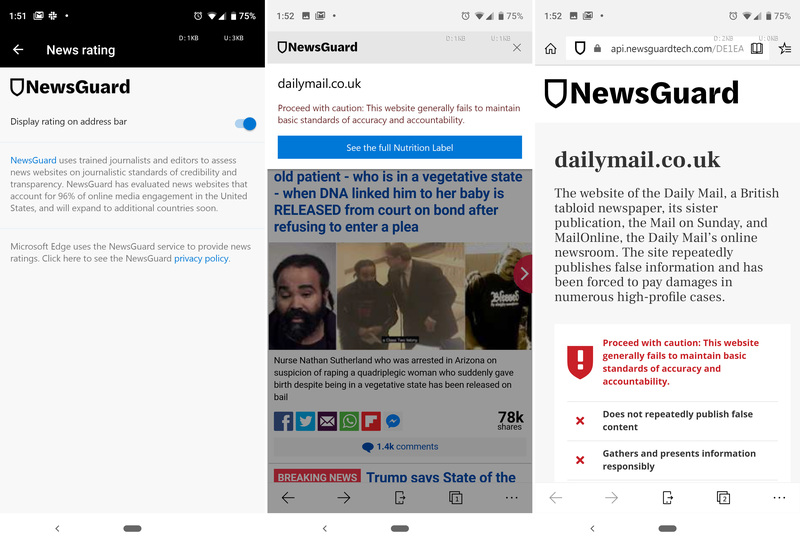 Microsoft has indicated that it may enable NewsGuard by default in the future, but it's unclear if NewsGuard will carry over when Edge Classic is retired.